Beaufort, South Carolina has a special meaning for us. 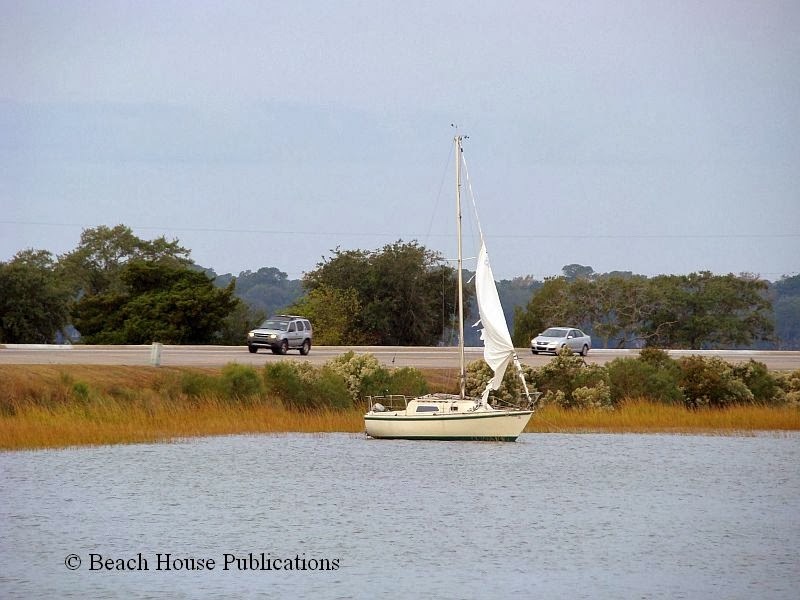 Aside from being a regular and well-liked stop along the ICW, it's also where we sold our Mariner 40 ketch, Sea Trek, and where we found and purchased Beach House. 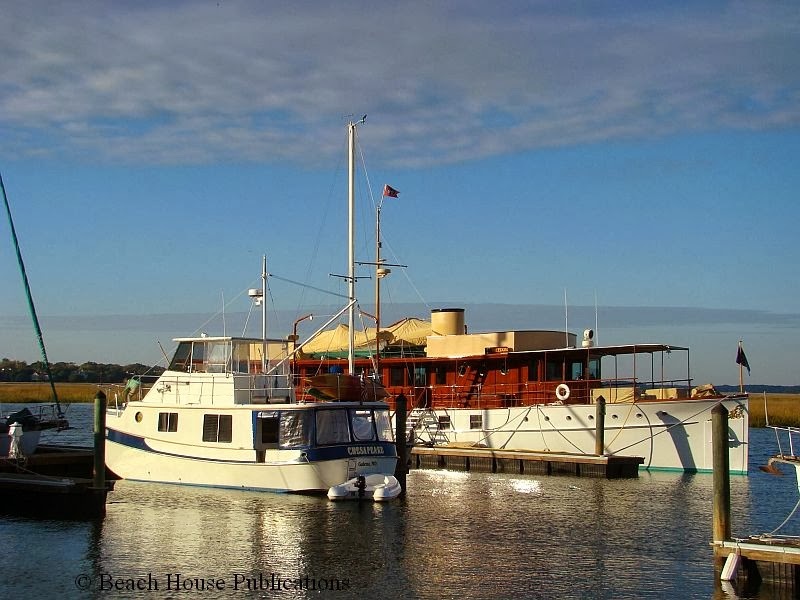 We also lived there for a year and a half and did a lot of the preparation on Beach House for cruising. Lady's Island Marina is always our choice when we stop for any period of time or need to hide from weather. Even if anchoring, we prefer Factory Creek, very near the marina. It isn't right in the downtown area, but is a short walk across the bridge. Factory Creek is very peaceful and away from the hustle and bustle of the Beaufort River, all of the traffic on the water and the very swift currents. There is current on Factory Creek, but it is not as strong as the main river. On the day we arrived, the Marina Manager, Steve, was at the dock to great us and assist with docking. The trick is always to dock driving into the current so the boat can slow down enough to let the current stop you and not try to keep carrying the boat away from the dock. 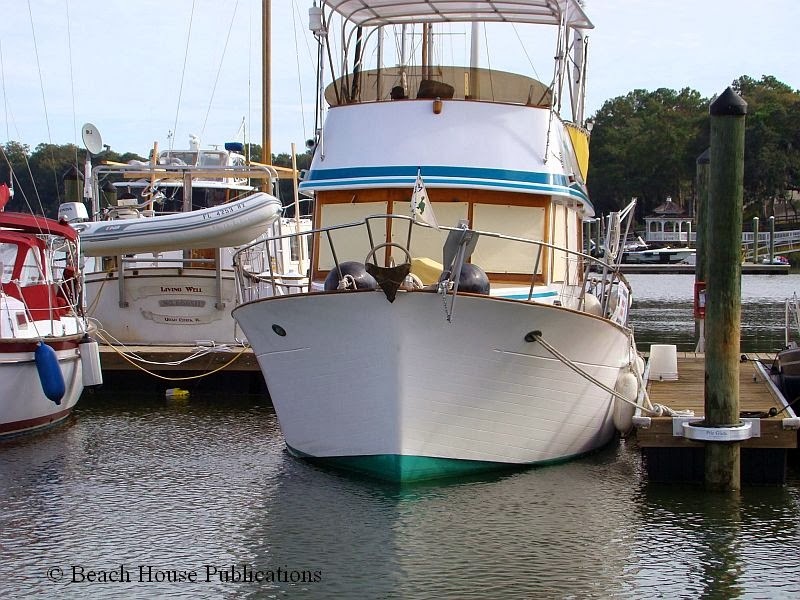 The floating docks also make docking easy and there is no need to keep adjusting the dock lines for the 7- to 8-foot tides. We had also made arrangements for friends that were a day or two behind us, so this would be a mini reunion. You can tell that Beach House was right at home and many of the familiar faces we knew immediately recognized us when we arrived. Once again, bad weather was going to keep us at the dock for awhile, so we planned to make the best of it. The closer the weather was to closing in, the quicker the slips filled. Soon there was not an empty slip to be had. As cruisers do, everyone got together and threw a "lousy weather" party on the deck while things were still comfortable. By the next morning, the winds picked up and began to howl. Gusts in excess of 30 knots were not unusual and the Beaufort River looked very nasty. Factory Creek only showed some wind ripples as things went downhill. By then, our friends had arrived and we enjoyed the company as we made plans for the next few days. We made use of the available transportation - the marina managers, Steve and Gloria, gave us the loan of one of their vehicles for grocery runs and shopping. Once that was out of the way, choosing which local eatery we would visit for dinner was next on the agenda. 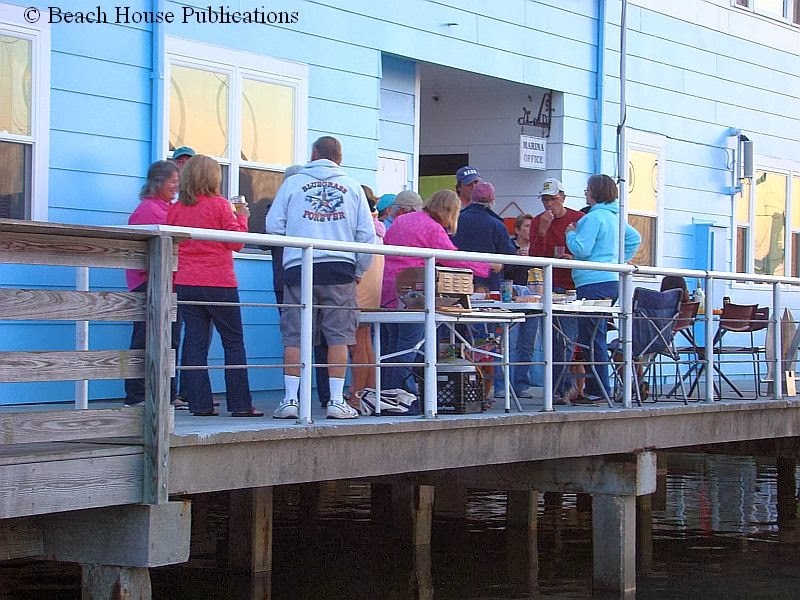 There is a fairly new restaurant on the marina grounds and several others close by. One local establishment, called the Fillin' Station, offers great meals at really low prices. There are nightly specials Wednesday through Friday, and we decided that Pork Chop Night sounded just about right. The place is just a local bar with a great view right on Factory Creek. The food is mostly prepared on a grill outside. Its very good and the portions are large. Not to mention the tasty cold beer. Friday night is steak night and we are told it's not to be missed. We missed it, however, to take advantage of a brief weather window. The next few days went pretty much the same. 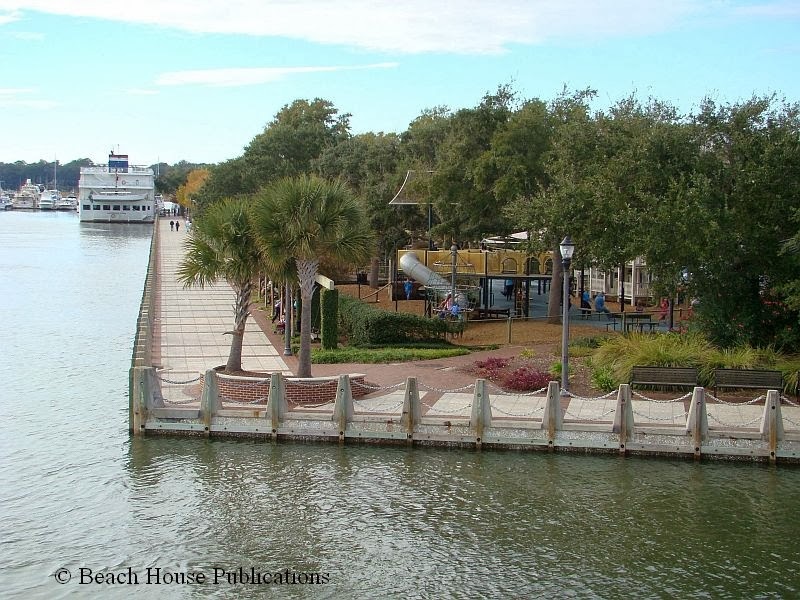 A nice walk across the Lady's Island Bridge brings you to historic downtown Beaufort. The downtown area is well preserved and the old buildings are a treat to see. There is an excellent park along the waterfront, and at the time we were there, it was very busy with tourists and local families. Also, a large river cruise liner was tied to the seawall. This seems to be a regular stop for the cruise ships now. Of course, we had to locate an ice cream shop to sample the flavors. The downtown is lined with restaurants, gift shops, galleries and all manor of merchandise. There are no grocery stores or pharmacies, etc. 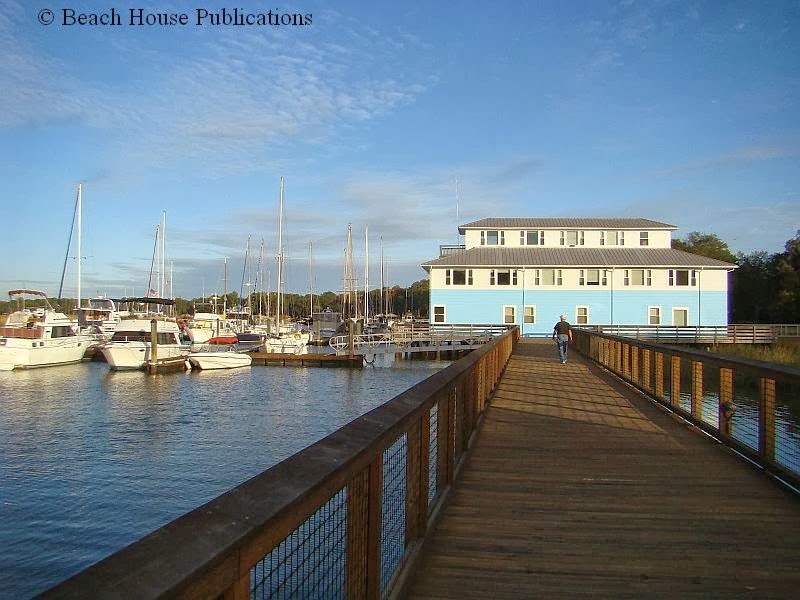 in the downtown area, but shopping is very close to Lady's Island Marina. A long afternoon of walking around town and eating ice cream left only one other thing to do. Go back to the boat and take a nap. As the wind began to let up a little each day, one by one the cruisers began to head out and move on farther south, each seeking warmer weather and trying to get to their ultimate winter destination in Florida or the Bahamas. It is sometimes sad to say goodbye over and over, but the thought is always in the back of your mind that you will meet again soon. Beach House was one of the last to leave, if only because we like it there so much. Like everyone else, that next waterway stop was calling and we, too, wanted to get somewhere warm. Just after sunup, the dock lines were cast off and once again, we were on the move. This was starting to wear on us just a bit. We have had a wonderful time on this cruise, but after being underway for almost a year, we looked forward to stopping for a while. Our destination on this day was a familiar anchorage off a small town in Georgia named Montgomery. Don't forget to visit and Like our Facebook page for lots of photos and up to date news.